I’m a couple weeks behind on my blog, so to backblog I will now feature DEATH STAR WEEK! “Yesterday’s” entry was the officially licensed Death Star cookie jar. 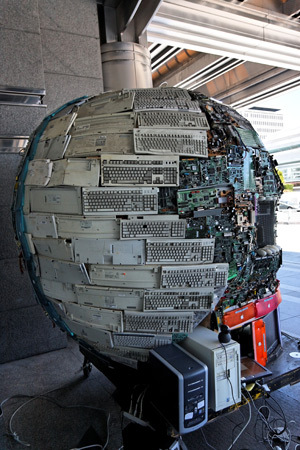 Today’s feature is the “Death star made with recycled computer parts” photographed by ennael_ of flickr via creativecommons licensing. It’s going to be hard to top this one. i’d like for this to be an actual operating supercomputer. What deathly power it would surely yield.